Image and appeal are everything in today’s world. The image of a player, the image of a club, and ultimately the image of a league make up the footballing experience. This creates a sense of excitement for paying supporters who provide revenue through TV deals and match day income. In the summer, the image of a club is most important to players and coaches when it comes to transfer season. For years, Bayern Munich have had the image of the glory team in Germany. The glitziest, most glamorous and successful team in Deutschland. This image was only realized in Germany though. Now with Pep Guardiola at the helm, their record breaking success of the 2012-2013 season, and the re-emergence of Dortmund on the European scene, German football has a new audience and Bayern is the star of the show. There is certainly nothing wrong with the German league in terms of image deals. 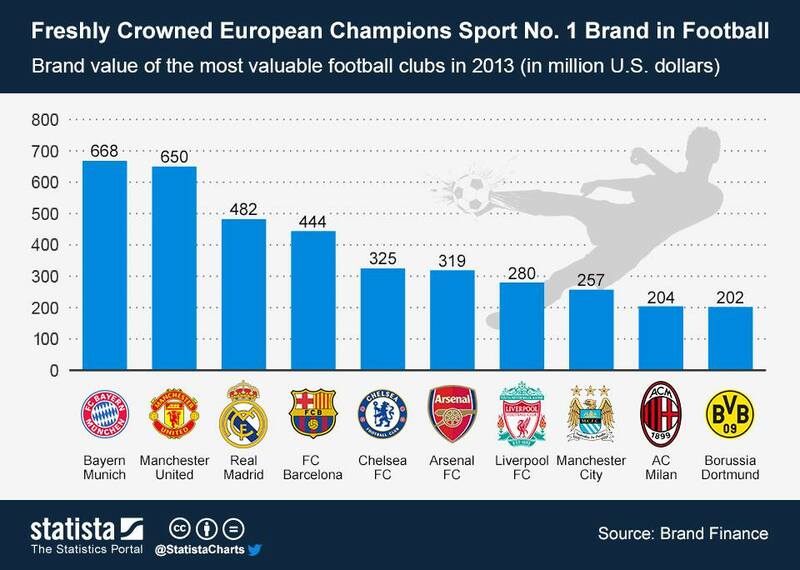 They have the highest average attendance at their games of all europen leagues, they are the only league that makes a profit as a whole, and they are the second most watched league in the world in terms of revenue. Surprised? They also have a number of superstars under their branch in Robben, Ribery, Schweinsteiger, Martinez, Goetze, just to name a few (who all play for Bayern, might I add). Even the most saught after manager in Pep Guardiola has chosen to go to Bayern. Now, Bayern has a wealth of superstars at their disposal as well as a superstar of a manager. Football has been branded by the image it portrays to its followers primarily on television. Image rights and television deals have become basic necessities each year when deals are struck. Even player image deals have become subject of negotiations during transfers. Such is the significance, that there have been discussions about playing exhibition games in exotic destinations – the fabled “39th fixture” that was on the table of the F.A. in England a few years ago is one example of this. Football has become about image and every game and every player has become so heavily scrutinized that almost every move a player makes ends up on YouTube, or some other blog, or maybe even this blog. How is it then, that Bayern Munich has managed to fly under our radars to become such a force in football today? Lets think about this a bit more. Bayern have always been there, and are definitely not just some one hit wonder. They were there in the background even through Barcelona’s dominance of club football in recent years. In the past 4 years, Bayern have been to the Champions League final 3 times, twice on the losing end. They are up there with the select few clubs who have made back to back finals sine the reconfiguration of the competition in 1992. Bayern have been continental winners 5 times, and runners up 5 times. In terms of finals appearances, they have 10, which is the third best of all time behind Real Madrid on 12 and AC Milan on 11. That’s enough of Bayern’s achievements. Let’s get to the point. The German league is in a bit of a conundrum: Bayern Munich are their biggest export and there is no need to change that, but at the same time it has been nearly impossible for another team to achieve the same amount of competitiveness on a world stage. Borussia Dortmund have once achieved glory on the continent in 1997 and were recent runners up to Bayern Munich themselves in 2013. Bayer 04 Leverkusen had made a finals appearance in 2002 and were threatening to become a force before the team fell apart. What happened to these clubs once they made it to the final 2 in Europe? Well, lets not go too far back in history right now. Let’s focus on the present. Bayern and Dortmund have just played a champions league final against each other. They have also been fighting for domestic glory for the past several years. Now, Bayern have taken Mario Gotze and are inlinr to take away Robert Lewandowski – arguably Dortmund’s two best players. How is it possible that Bayern have been able to court two of its closest domestic rivals’ best players? I would highly doubt that you would see Real Madrid making a swoop for Messi and Iniesta over at the Camp Nou any time soon (Figo was an exception). Maybe football is at a crossroads in some way, now that image and money has actually become a big deal to everybody, and it is hard to find players who bleed for the team they play for. Bayer 04 Leverkusen and Schalke 04 have also made minor forages into the Champions League in recent years (Leverkusen were manhandled by Messi and co. 10-2 on aggregate and Schalke 04 were dismantled by Manchester United 6-1 over 2 legs). It is critical for these teams to keep a hold of their players and continue to move forward, rather than cash in and pay the bills – rarely do football teams make profits anyways. Perhaps then, we will see these teams emerge to be competitors to Bayern domestically. Competition is, after all, competitive, and it would be healthy to see Bayern are not competing with only minor feeder clubs for the Bundesliga title in the future. Borussia Dortmund on the other hand are trying their best to flex their muscle in front of Bayern, but they do not hold all the cards. Contracts renewals, player demands, and personal choices play a large part. They look to keep hold of their star striker, Lewandowski, for the last year of his contract. This comes at a cost of loosing out on his transfer value. At the same time, they have immediately made use of the 37 million euros gained from Gotze’s sale. Signings were already lined up and no time was wasted. 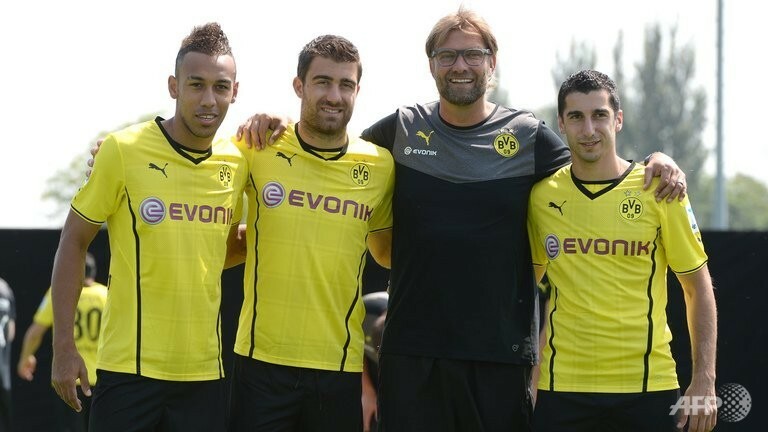 The capture of Aubameyang and Mkhitaryan, for 13 mil and 27.5 mil respectively, have arguably made Dortmund even stronger. So, can there be a team to break Bayern’s stranglehold on being the German poster boy? Can Dortmund survive this transfer window and become that team, or will their best players not be able to resist the blinding lights at FC-Hollywood? Too many questions can be asked about what will happen. For now, we can say that the German league can do no wrong and Bayern is leading the way. This may not be good for the competitiveness of the league but in terms of the league’s image on the continent, they might well be up there for good with the likes of the Premier League sooner rather than later. After all, all that is needed is for Dortmund to reach the heights of Bayern and you’ve got the level of competitiveness of La Liga.